With best-in-class boot capacity and ample interior space for five adults, Logan MCV offers unrivalled pound-for-pound versatility. Every inch a "Maximum Capacity Vehicle", Logan MCV makes responding to the real demands of life that little bit easier. Whether it's a new piece of furniture or your family and their luggage. Logan MCV's extraordinary load capacity will get you there with room to spare. With a 573 litre boot which expands to 1,518 litres with the rear seats folded down, transporting large and awkward items is a doddle. A 60/40 split-folding rear seat and a forward-folding front passenger seat also make for a maximum flexibility when driving with rear passengers or transporting longer items. With Logan MCV Big space doesn't mean big running costs. The state-of-the-art TCe 90 3-cylinder turbocharged petrol engine combines peppy performance with frugal fuel effciency and CO2 emissions of just 116 g/km. Or, for long distance cruising, why not choose the dCi 90 diesel engine, with combined fuel consumption of 74.3mpg and CO2 emissions of just 99 g/km. 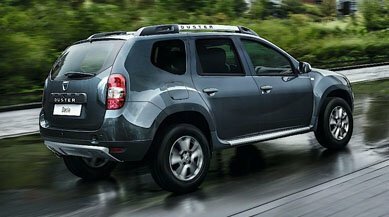 At Dacia, our simple range of cleverly designed cars only useful technology. That's because we believe you should only pay for the things that you value, rather than those you don't. Priced from just £8,495 on-the-road, Dacia Logan MCV offers a groundbreaking combination of practicality and affordability. Take our rear parking camera for £200, for example, Or, how about luxurious leather upholstery for £500. With three simple trim levels, a range of useful options and extended warranty up to 7 years / 100,000 miles, it's easy to tailor a package to suit you. Dacia Logan MCV. Maximum Capacity. Minimal cost.